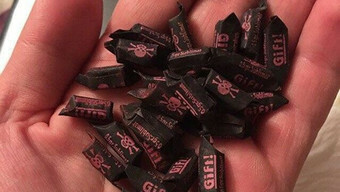 A 26-year-old resident of Kaliningrad, Sergey Popov, found an old bottle of the beginning of the 20th century at one of the construction sites of the city, inside of which there were more than 20 small candies with the image of crossbones on the label. “I have been searching and collecting since I was 14. And in my collection there are 25 bottles of poison from 30 milliliters to a liter. But for the first time I ran into paper bundles. I looked at what was written on the labels, entered Google, found it there description of this poison. On the wrapper is written “poison” in all languages, including Russian with a firm sign at the end, “- Popov told RIA Novosti. The young man said that the bottle was produced, presumably at the beginning of the 20th century, the contents were preserved so well, according to him, because the bottle was tightly closed with a cork stopper. “I have dug up brewer’s yeast in tablets, they are sealed and lay underground for a hundred years. Since I have been collecting for a long time and I have many interesting items in the collection, mostly bottles, of course, I want to have a small museum in the future,” said Popov . Next story Woolly mammoths and Neanderthals may have common genetic traits.